The Internet of Things (IoT) market has been skyrocketing. A recent market analysis published by the Boston Consulting Group predicts that by 2020, $267B will be spent on IoT technologies, products, and services. Such growth is driving many companies to enter the market, with hopes of snagging a piece of the pie. Obviously, not every company launching a new IoT product will succeed. In fact, many of the companies entering the IoT domain are doing so with a strong technology, but will still struggle. What are they doing wrong, and how can your company apply an approach to bankable innovation? The succinct answer is that you first need to solve an existing problem. IoT does not escape the basics of good product design. Cool technology still needs to solve a real-world problem. In this article, we will walk you through a creative approach to problem-solving. This approach — also known as Design Thinking — is a proven method for success and innovation in your next IoT project. 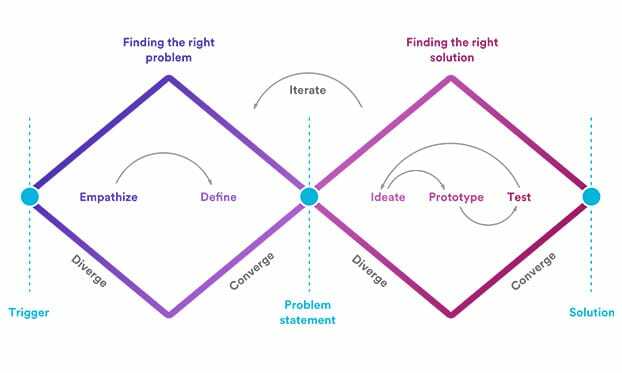 It is an extremely useful approach in tackling complex problems by understanding the human needs involved, reframing the problem in human-centric ways, creating multiple ideas, and adopting a bias-towards-action attitude in prototyping and testing. The good news is: you don’t have to be a designer, committed inventor, or an expert empath to employ this method and change your mindset. Anyone can do it. In fact, if more people made use of this method, the world would have much better products and services, and consequently people would be living better lives. Do you want to take a part in shaping this vision of the future? The process we are about to walk you through employs a method of divergent and convergent thinking as a way to innovate. When diverging, you are creating choices. When converging, you are making choices. Understating the following phases will empower anyone to utilize Design Thinking methods to create a successful IoT product. The double-diamond process, initially introduced by The Design Council in 2005, and adapted by ICF International. “If I had only one hour to save the world, I would spend fifty-five minutes defining the problem, and only five minutes finding the solution”. — Albert Einstein. The best way to come up with an innovative solution is to begin without the end in mind. Most startups and entrepreneurs observe a problem and create a hypothesis about the solution. It’s OK to hypothesize, but most people stop there and start working on the solution they have imagined. In order to truly innovate, we advocate that you step out of outcome assumptions and start by uncovering the root causes, and how people currently deal with them. Stepping out of your assumptions will allow you to see whether the solution is really the best outcome for the root cause you discover. The process itself will eventually devise a solution you may have never thought of by yourself, from inside your office. Let’s look at an example from one of our clients, an engineering company who was launching a new hub for home automation. The founder came to us with the assumption that his main differentiator was the wide variety of devices that someone could easily connect to a smart home (in other words, the technology). After empathizing with the target population, we found that connecting a variety of devices did not resonate so much with them because they didn’t know what could be made possible by connecting that many devices to the home. They thought everything had been done already. This causes a pivot in the user experience we ended up designing. The key differentiator, in turn, became to show the user which scenarios were possible with the devices they had, and what else could be made possible by adding new devices to the home. We built a prototype that highlighted the solution to the real user needs we identified, allowing for an easy way to set up and enable such scenarios. This got the audience more engaged in making a better use of their home, which was the goal of the product and the real problem being solved. We did not need to rethink the company’s basic premise, we just needed to refocus their attention on the real customer pain points for their domain. With this story in mind, let’s look in more detail at what steps you can apply to innovate in your next project. We advocate that you begin by understanding people’s experiences and motivations. Get out of your office, and go immerse yourself in their environment to get a deeper understanding for the issues involved. Interview and observe a variety of people. This is a divergent phase, so gather lots of data and observations. Don’t try to make sense of it all yet. You need to first understand the people you are solving a problem for, and the context this is happening in, before jumping into exploring possible solutions. In our example, we performed 1:1 interviews with a number of target users. Remember: approach this process with a beginner’s mind, and repeat to yourself: “I am not the user”. Do not assume you know what the user wants, or what the solution should be at this point. In our example, we had the company founder with us in the interviews. This helped him see and hear directly from his target user what he had missed when conceiving of his new solution. Now that you’ve gathered observations you made in the field, it’s time to look for patterns and themes. One method to do that is by creating an affinity diagram. Write every observation on a post-it note, and collaborate with your team in grouping notes by similarity. We like to do this in a large conference room with a lot of wall space. In our office, we have an entire wall dedicated to this purpose. Observe which themes start to emerge. Themes are groupings of observations that relate to the domain in a similar fashion. You will find that there are insights into how people are dealing with the problems within the domain you are working on, and this will enable you to more objectively view some of their needs and wants since you are seeing it in their own words. In the example, we discovered that this target audience could not imagine what kinds of new scenarios could be attained by connecting their home and devices. This changed how the idea was going to be messaged and what the initial experience needed to be like, as well as what happened whenever a new device was connected to the home. After gathering insights around the humans and their context, it is time to boil those insights down to a statement about the problem you are solving. Start out by generating many problem statements and then, as a team, figure out which one best defines the situation. A problem statement is important to the success of your product, because it will guide you and your team, and provide a focus on the specific needs that you have uncovered. A good problem statement should be human-centered, broad enough for creative freedom, and narrow enough to make it manageable. After you’ve identified the right problem to solve, it is time to diverge and go broad again. By now, you know who the product is for, and what their needs and pain points are. You’ve analyzed and synthesized your observations, and ended up with a human-centered problem statement. With this background, you and your team can start to ‘think outside the box’ to identify new solutions to the problem statement you’ve defined. At this stage, it is time to stimulate free thinking, and to expand the problem space. It is important to get as many ideas or problem solutions as possible at the start of the ideation phase. Don’t judge any idea yet — the more the better. You will later evaluate which ideas are worth prototyping, but first you need to come up with lots of ideas. Good ones. Bad ones. Impossible ones. Silly ones. It is important not to censor yourself at first. There are lots of ideation techniques, such as Brainstorming, Worst Possible Idea, and SCAMPER, just to name a few. Use those techniques as frameworks for creativity. Once you’ve come up with a bunch of ideas, pick a few that your team thinks are the most promising to be prototyped and tested. And keep this idea bank in your back pocket. Since innovation is an iterative process, you might be returning to further explore some ideas you decided to leave behind for now. In our example, we first created a variety of solutions for our problem statement. We then returned to the heuristics (rules of thumb) that we built with the stakeholders back at the beginning of the process, and judged whether the proposed solutions met the stakeholder’s vision of success. That also helped us choose which solutions to prototype and test. Developing a product and bringing it to market is a very expensive and time-consuming endeavor. 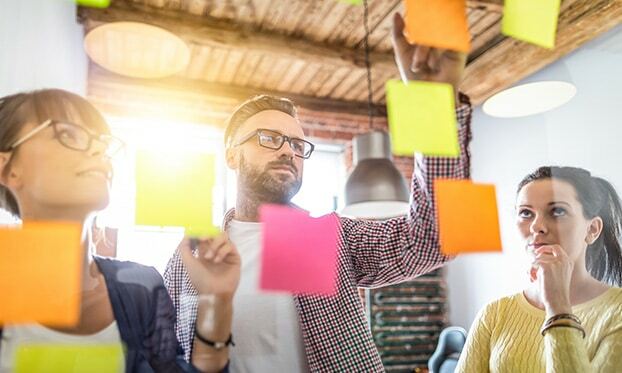 The main goal of prototyping is to make ideas tangible so that they can be understood and evaluated before committing them to lengthy development and testing. A prototype is a cheaper-than-making-the-real-thing way to understand and evaluate the viability of the solution. Additionally, the mere fact of creating a prototype will bring more clarity to the problem you are trying to solve, and might inspire new ideas and solutions. It embodies the bias-for-action mantra. If a picture is worth a thousand words, how much is a prototype worth? A prototype can be as simple as a sequence of static images, or as advanced as a fully interactive simulator. Let’s take the interactive mirror example. A simple prototype could be just mocking-up the interface in a monitor or tablet, and placing that screen behind a pane of glass with a reflective coating on it. In a more complex prototype example, we were in the process of creating a next-generation infotainment system for vehicles. Before we embed the device in an actual vehicle (a high risk, costly endeavour), we wanted to simulate the experience in a controlled environment. 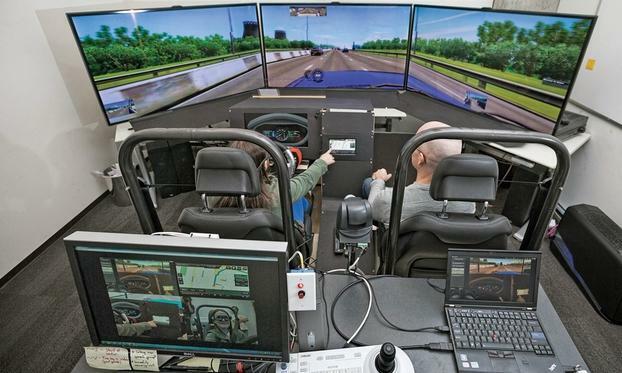 What we did was place a monitor behind a video game steering wheel to simulate the instrument cluster, a tablet within arm’s length to simulate the center console screen, and used a driving simulator to simulate the road. You could do this even cheaper by simply placing a monitor displaying a road scene, as viewed from the driver’s perspective. There are several levels of fidelity you can get with a prototype. You should always start with something basic and quick and evolve from there as you learn more about the problem space and your solution. The driving simulator at Microsoft’s Windows Embedded Automotive business. Source: Automotive News. Naturally, the closer your prototype gets to mimicking the real situation, the better, however remember the mantra, “Fail fast, succeed faster”. It is better to have a lower fidelity prototype to begin with, then add fidelity as you learn. You don’t need to, and most likely won’t, hit a homerun with your first iteration. Prototyping is about modeling the world as it could be. Prototypes can create inspiration and help you learn valuable lessons that will save costly development time down the road. Finally, it’s time to learn from the solution you decided to prototype. At this stage, you will bring representative users to walk through a number of tasks using your prototype. The results generated during the testing phase are often used to redefine one or more problems, and inform a better understanding of the users, the conditions of use, and how people think, behave, and feel. During this phase, alterations and refinements are made that get you closer to a truly useful, innovative product. In this article, we’ve outlined a method for innovating in your next IoT project. If you want a piece of the IoT market share, think about applying this creative approach to problem solving to your next project. We wish you the best in your next IoT creation. Your users, your business, and the world will thank you for bringing something meaningful into existence.